Click here for audio of Episode 234. Today, let's talk about showmanship, technology, and Dolly Shepherd. The University of Houston's College of Engineering presents this series about the machines that make our civilization run, and the people whose ingenuity created them. When we put a person on top of a rocket and fire him into space, we're doing something with a rich tradition in the Western world. We're honing an exciting new technology on a very public stage. That's what the aerial showmen of the last century did. They took the risks that had to be taken before flight could become part of our lives. Modern astronauts may have NASA behind them, but they're still kin to those early risk-takers. Take the parachute. Andre Garnerin was first to jump from a balloon in 1797. He could talk his wife into making only one jump, but his niece took it up for a living. From then on women continued parachuting all through the 19th century. 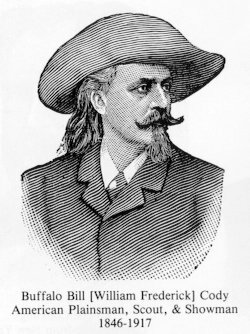 In 1903, the same year the Wright Brothers flew, Buffalo Bill Cody took his Wild West show to London. Cody had trouble there. When he put on a blindfold to shoot a plaster egg from his wife's head, the bullet creased her scalp. A 16-year-old girl named Dolly Shepherd came out of the audience to take her place. To thank her, Cody took her to an aeronaut's workshop. Dolly was given work as a parachutist, and she quickly became the star of the troupe -- heady stuff for a young girl. It was dangerous work. She saw her first fatality when a girl in the troupe landed on a factory roof and was dragged over the edge. Others died, and she was almost killed several times. In a typical jump, two girls would get ready. They'd open a vent hole in their balloon so it would start down. Then they'd jump. One day, after Dolly'd vented the balloon, she found the other girl's ripcord was jammed. The two had to jump together from 11,000 feet using Dolly's small parachute. Dolly was paralyzed in the landing. A doctor, who obviously thought like a barnstormer, subjected her to a massive electric shock -- hardly accepted therapy in 1912. But Dolly was lucky. The shock unlocked her paralysis. While she was getting her strength back, her mother secretly jumped in her place. Dolly jumped again, but she began seeing the face of Death in all this, and she gave it up. Two years later she joined the war in France as a driver mechanic. She was 96 when she died in 1983. She lived to see a man on the moon and a rocket circling Saturn. It was a world that she'd helped make, because inventing a new technology is only part of bringing it to the world. Risking its use is another part. Dolly Shepherd was one of those risk-takers. But she lived to see women stepping off the face of the earth in rockets -- just as primitive, just as new -- as the parachutes she'd used when she stepped off into the sky, 80 years before. 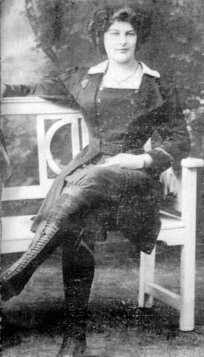 Lomax, J., Women of the Air . New York: Ballantine Books, 1987. For more on early parachuting, see Episode 1316.. This episode has been greatly revised as Episode 1889. 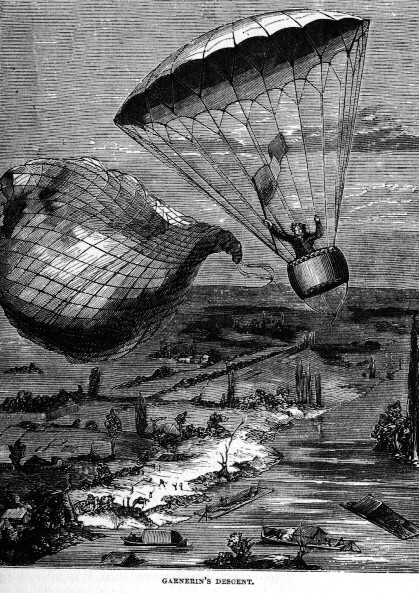 A mid-19th century impression of Garnerin parachuting from a balloon.